HARMAN Professional Solutions is pleased to introduce the JBL 9350, a high-output, 3-way, 15-inch configurable pattern surround loudspeaker designed specifically to meet the challenging demands of immersive cinema sound systems. Cinema surround loudspeakers have gone through a substantial evolution over the past few years with the introduction of immersive audio systems. Immersive cinemas require much higher output and significantly more coverage and control from the surrounds. In most immersive systems, each surround loudspeaker is individually amplified, because the audio content in the speaker is unique. The JBL 9350 is an ideal complement to the main screen channel for sonic character and dynamics. Surround speaker requirements vary based on the geometry of the theater and whether the speaker is a rear surround or a side surround. The JBL 9350 has setting options for adjusting the surround coverage based on the location of the speaker. 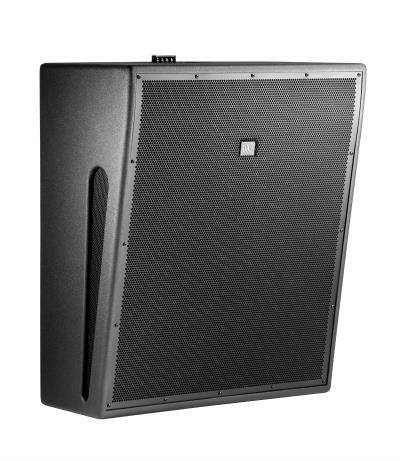 With a passive crossover network, patented waveguide technologies and line array techniques, the JBL 9350 coverage pattern can be sculpted depending on settings. The system’s Acoustic Divider waveguide improves low and mid-frequency performance while providing a smoother frequency transition. The Bi-pole Wall Decoupling reduces the wall reflection notching typical of surrounds by shaping rear hemisphere energy. The 9350 further enhances coverage by configurable vertical and horizontal coverage angles based on whether the surround is located on the rear or side wall location. This results in premium performance and left/right balance overall, an accomplishment unheard of in cinema. It means the sonic sweet spot just got a whole lot bigger, and that sculpted, impactful sound now comes from all sides. Ultimately, the audience becomes immersed in an audio experience like no other. Rely on the 9350, the ideal complement to front screen loudspeakers, for superior sonic character and dynamics everywhere.